As an eighteen year-old, Sylvester Burks had to choose between a request from Rev. James Cleveland to go on tour or finish his studies. At his mother’s request, Burks obediently chose the books, but the poignant “Till the Morning Comes,” arranged and produced by Burks, demonstrates that if you have the talent, music will find you, no matter what. Ironically, the cry in Derick Hughes’ voice is reminiscent of James Cleveland. Ashling Cole delivers a marvelous second lead on this song of encouragement and hope in the darkest hours. Here, Jesus is depicted as a loving parent, “a light till the morning comes.” Passionately delivered and heartfelt. While the mainstream gospel music audience may not know Sylvester Burks, ask top gospel musicians and singers such as Tramaine Hawkins, Yolanda Adams, and Donnie McClurkin, and they’ll know him because they have worked with him. Burks also teaches keyboards, provides music for a whole circuit of churches in the Bay Area, and is finishing the full-length album on which this single will be included. Burks is a recording artist for Herman Williams, Jr.’s C&W Records imprint, founded in 2007 in Memphis, TN. 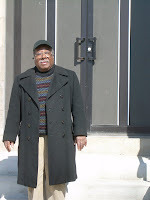 TBGB learned today from both Joseph Middleton and David Jones that Eugene Smith of the Roberta Martin Singers died today, May 9, at his home in Chicago. The senior living apartments where Smith was a resident confirmed his passing. They found his body in his apartment this morning. Eugene Smith just recently celebrated his 88th birthday; “Gospel Memories” dedicated its April 6 program to him. Smith was a charter member of the Roberta Martin Singers, joining in 1933 when it was known as the Martin & Frye Quartette. He became the group’s manager when Martin decided to leave the road and concentrate on her publishing business. I had the great pleasure to have known Smith these past few years and considered him a friend. He was one of the last of the living gospel pioneers. We were planning to go out to Burr Oak this Memorial Day weekend to visit Roberta’s grave and tidy it up a bit. It was a trip Eugene made many a Memorial Day to pay tribute to the woman who was so much a part of his life. Here is an article from the New York Times. Scholar and author Anthony Heilbut, a friend of Smith’s for 50 years, is quoted in this piece. The Chicago Tribune’s Sara Olkon contributes this remembrance: Eugene Smith. Visit Joseph Middleton’s tribute to Eugene on YouTube. 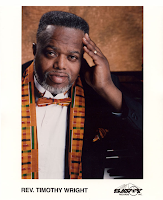 This Saturday morning’s “Gospel Memories” program will pay tribute to Eugene Smith, the celebrated singer, manager and announcer for the Roberta Martin Singers. Please join me in remembering this special man and praying for those whom he touched so deeply over the years with his singing, his personality and his abiding faith. Photo: Eugene Smith in front of Ebenezer M.B. Church, where he met Roberta Martin in 1933 and became a member of the church’s Junior Choir the same year. A division of Jive Label Group, Verity Gospel Music Group is comprised of Gospocentric Records; Kirk Franklin’s Fo-Yo Soul Entertainment; Quiet Water Entertainment; F. Hammond Music and New Life Records. Verity Gospel Music Group is based in New York. When legendary quartet leader Rev. 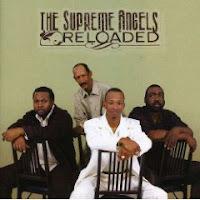 Howard “Slim” Hunt of Slim and the Supreme Angels made his transition from labor to reward in 2007, the inevitable question was: what will happen to the Supreme Angels? Hunt was the heart and soul of a group that was active for more than a half-century. Hunt solved that problem in advance by grooming his son, Quincy King, to be his vocal successor. On the quartet’s latest project, the appropriately titled Reloaded, King — nicknamed Slim, Jr. — is in the mix along with stalwart members Robert “Sugar” Hightower (remember him as the sassy-confident child lead of the Hightower Brothers? ), Maurice Robinson and Michael Kimpson. King gives the Supreme Angels a more youthful vocal sound, and the retro soul seventies feel the musicians cultivate throughout Reloaded is, if not timeless, still very much in vogue. The songs (save one) are new but lyrically they traverse quartet holy ground: shelter in a time of storm, thanksgiving for blessings, holding on against all odds, surviving in a tough world with lots of questionable choices, Mother, and the need for spiritual healing. The CD opens and (almost) closes with quartet handclappers. “Wicked Land,” a take on “My Lord’s Gonna Move this Wicked Race;” and “What’s the Matter with Jesus” are 100 percent pure Supreme Angels fare. “How Long” showcases superb lead vocals and a music riff reminiscent of English pub band Ace’s opening salvo in its seventies hit of the same name, but it is not the same song. “Hold On and Never Give Up” is bouncy and bright Northern Soul. In the receeding seconds of “Your Touch is All We Need,” the quartet beseeches the Lord to watch over and protect a litany of their quartet bretheren, such as the Canton Spirituals. Listen for Sugar’s biting guitar solo on “Don’t Let the Devil Steal your Joy” and the Supreme Angels’ performance of the reverential hymn, “I Need Thee Every Hour,” which closes out the project. Slim Hunt may be gone, but his legacy lives on in the Supreme Angels. On Monday, May 4 from 1:30 to 4:45 p.m., TBGB editor Bob Marovich will join a panel of experts at the Gospel Complex for Education and Preservation Annual Conference to discuss “The Chicago School of Gospel.” The program will be held at Nova Southeastern University in Davie/Fort Lauderdale, FL. The story of gospel music as it proliferated from the Chicago area through known and unknown personalities in the Gospel Music tradition. In the discussion, we will highlight the impact of the “noted hotbed churches” which gave birth, fostered and nurtured Gospel Music in its embryonic stages and through its controversial and often turbulent times. The discussion will include the early church radio broadcasts which impacted church ministries and served as a forerunner to national radio and television broadcast ministries of today. We will also discuss the musical influences of the Churches of God in Christ on Gospel Music. Attention will be given to the pioneering songwriters, composers, arrangers, publishers and musicians who all together developed and contributed to what scholars labeled the Chicago School of Gospel – thereby confirming and validating Chicago’s place as the undisputed “Mecca” of the Gospel Music tradition in America. 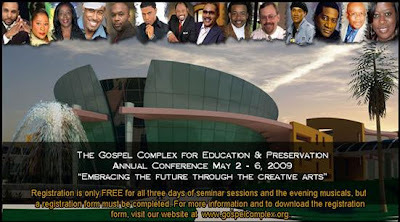 For more information or to register, visit www.gospelcomplex.org and click on “Annual Conference.” Hope to see you there! 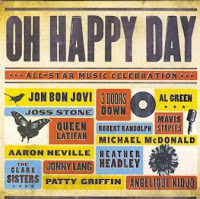 In the spirit of T Bone Burnett’s Grammy-winning coupling of bluegrass queen Alison Krauss and rock icon Robert Plant (Raising Sand), a cadre of producers pair rock and pop artists with gospel singers on Oh Happy Day: All-Star Music Celebration. The result? Combinations that are at once improbable and divinely inspired. The seamlessness of each performance may be due to the top-quality of the artists, the know-how of the producers, the fact that gospel music is the underpinning of most American pop music, or all three. Regardless, this project is simply electrifying. Each track is distinctive, yet each seems drawn from the part of the soul that is beyond human understanding. Standout performances on the collection include Jonny Lang channeling the guitar wizardry of Elder Utah Smith on John P. Kee’s “I Believe,” as the Fisk Jubilee Singers let their hair down and back him with an uncommon funkiness. The Clark Sisters seem born to sing Stevie Wonder’s “Higher Ground,” on which they share studio time with petal steel guitar legend Robert Randolph. Mavis Staples and Patty Griffin win the award for the collection’s rootsiest duet on the Consolers’ “Waiting for My Child to Come Home,” although Joss Stone and Buick Audra’s harmonica-dominated informal jam session on “This Little Light of Mine” comes in a close second. The title track is an old evangelistic hymn made famous when Edwin Hawkins and the Northern California State Youth Choir gave it a west coast easy feeling. Here the song is led by Queen Latifah, who can do just about anything, with Rev. Stefanie Minatee and Jubilation as the choir. Rev. Minatee is kin with the late Rev. Lawrence Roberts (Angelic Choir), so she knows a thing or two about choral singing. It shows, too, as Jubilation offers a bright but brassy backdrop to Latifah’s gospel vocals, which sound as natural as breathing. Arguably the strongest performance on the album is Jon Bon Jovi and the Washington Youth Choir doing “Keep the Faith.” The handclapping, Holiness-inspired arrangement demonstrates just how deep the sacred has permeated secular music. What’s especially pleasing about Oh Happy Day: All-Star Music Celebration is that the gospel component is not treated as exotic or otherworldly but is afforded the same musical respect as the rock artists. Hallelujah! Back in the day, Conrad Miller was a card-carrying member of the Soulful Seven, a nationally-known group whose cover of the Swingin’ Medallions’ “Double Shot of My Baby’s Love” (MGM) is a northern soul collectors item. Miller also wrote the passionate “Carla My Love” for the Softones, a sweet soul group from the Seventies with a sound similar to the Stylistics and Manhattans. Although Miller grew up singing in his church choir and is now vice chairman of the Deacon Board at Second Baptist Church in Doylestown, PA, until recently he hadn’t stepped out as a gospel artist. After the untimely death of his daughter Lauren a day after her sixteenth birthday, the singer/songwriter decided life was too short to put off his official entry into the sacred music industry any longer. My Journey, produced and arranged by GRAMMY, Stellar and Dove Award-winner Steven Ford, is the product of that decision. The lyrics may be grounded in personal faith, but the songs on My Journey sound as if they were pulled off old vinyl records. Miller has maintained his charming, pleasant tenor voice, and delivers his songs in a polite, reverent manner. Expert backing comes from strong, tight male groups (variously the “Back Bench Boys” and a quartet that includes Steven Ford) that give the album a quartet sensibility. The eleven songs are amalgams of traditional gospel and sweet soul, with Biblical references peppered throughout the lyrics. Thematically, Miller sings of redemption from worldly appetites, the pleasures of salvation and the service and thanksgiving that follow. For example, on “Blessed by the Best,” a no-nonsense angel throws Miller down to get across his point. Many tracks employ the three-and-a-half minute soap opera technique that was compulsory for pop song architects during the transistor radio era, though on My Journey, Miller stretches some to five and six minutes. 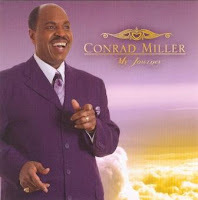 Fans of classic soul and gospel quartet especially will appreciate Conrad Miller’s My Journey. Congratulations 40th CMA Dove Awardees! Grammy-nominated gospel singer Reverend Timothy Wright died April 23 at the age of 61, months after a tragic July 4 car crash that left him critically injured and also killed his wife and grandson. Wright was the pastor at Grace Tabernacle Christian Center Church of God in Christ, located in the Crown Heights section of Brooklyn. He released more than a dozen gospel recordings, writing many of the songs. His latest album, “Jesus, Jesus, Jesus,” came out in 2007. In 1994, his record “Come Thou Almighty King,” with the New York Fellowship Mass Choir, made the Billboard Top 20 charts for gospel albums and was nominated for a Grammy for best traditional soul gospel album. He got another nomination in that category in 1999 for “Been There Done That,” recorded with the B/J Mass Choir and featuring Myrna Summers. According to the book “Uncloudy Days: The Gospel Encyclopedia,” by Bil Carpenter, the Brooklyn-born Wright began playing piano for his local church at age 12 and also began composing at a young age. By his early 20s, he was music director at Brooklyn’s Washington Temple Church of God in Christ. Wright was critically injured July 4 in a three-vehicle crash on Interstate 80 near Loganton, Pa. Another car was going the wrong way when it struck Wright’s car. His wife, Betty Wright, 58, was killed in the crash, and their 14-year-old grandson, D.J. Wright, died later at a hospital. The driver of the wrong-way car, John Pick, also was killed, while a passenger in a third car was injured. The Wrights were returning from a Church of God in Christ conference in Detroit, said Leroy Johnson, a trustee at Grace Tabernacle. Contemporary gospel singers The Nevels Sisters of Youngstown, Ohio are not compared to their Detroit inspirations, the Clark Sisters, for nothing. Veniece Andrews, Debra Jordan, Gail Nevels and April Wade have a style and tightness of harmony that only sisters can pull off with aplomb. 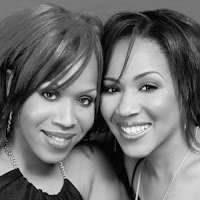 They also have plenty of experience, singing together since children and releasing their first album back in 1984. “Beautiful,” from the Nevels Sisters’ new CD of the same name (released last November), is God’s tender affirmation to his female creation. It’s a call to recognize one’s inner beauty and in doing so, to forsake behaviors like prostitution and addition that threaten to poison the mind and the body. The authentic string section adds lushness to an already rich RnB-flavored melody and strong beat. Check out the single’s companion video. The Christian mime, acting out the lyrics as conscience personified, steals the show!